Buy A3144 Hall Effect Switch online in India at low price from DNA Technology, Nashik. 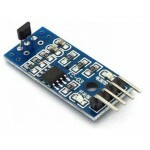 A3144 is a Hall effect Switch/Sensor. 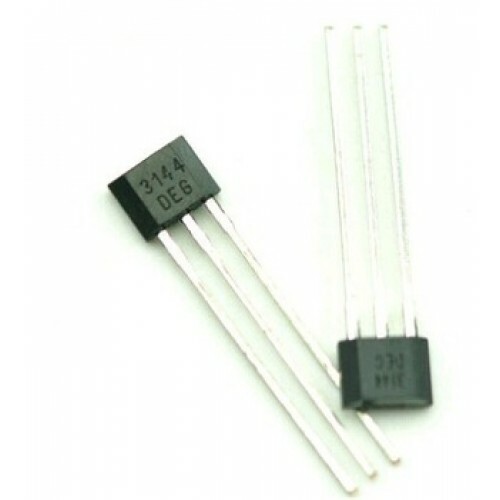 A3144 is a monolithic integrated circuits with tighter magnetic specifications, designed to operate continuously over extended temperatures to +150°C, and are more stable with both temperature and supply voltage changes. The unipolar switching characteristic makes these devices ideal for use with a simple bar or rod magnet. Each device includes a voltage regulator for operation with supply voltages of 4.5 to 24 volts, reverse battery protection diode, quadratic Hall-voltage generator, temperature compensation circuitry, small signal amplifier, Schmitt trigger, and an open-collector output to sink up to 25 mA. With suitable output pull up, they can be used with bipolar or CMOS logic circuits. 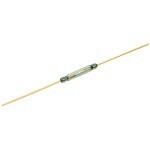 Reed Switch-Reed SensorReed switches also called as Reed Sensor is a electrical switch/sensor than c.. 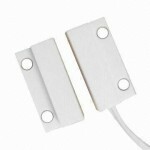 Magnetic Door Sensor 27mmWant to sense is door is open or closed? This is the perfect low cost senso.. Linear Hall Effect Sensor ModuleComparator Based Linear Hall Effect Sensor ModuleThis is a Comparato..